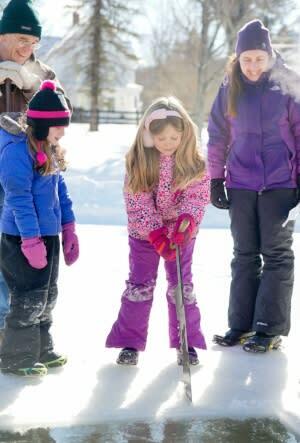 East Meredith, NY – Hanford Mills Museum will hold the Ice Harvest Festival on Saturday, February 3. Adults and children can take part in a traditional ice harvest using historic tools and techniques. Before refrigeration, cutting ice from frozen ponds and rivers was an essential winter activity. The ice was stored in ice houses until it was needed in the warmer months to keep food and milk cold. The Ice Harvest Festival, which will run from 10 am to 3 pm, also features ice carving by the SUNY Delhi Hospitality Center Ice Team, horse-drawn sleigh rides, a snowman village, hot soup buffet, blacksmithing demonstrations, and exhibits by local businesses and farmers. In addition, volunteers from the Dave Brandt Chapter of Trout Unlimited will give children the chance to ice fish, with all equipment provided. The Ice Harvest Festival began in 1989 with about 75 people and now regularly brings 1,200 or more people to the small hamlet of East Meredith in Delaware County. Since December, Museum staff have been monitoring and grooming the ice to ensure a good crop of clear strong ice. “It’s a very family-friendly event. Some people who came as children are now bringing their own children,” says Museum Executive Director Liz Callahan. “People value the opportunity to take part in an authentic experience and to connect with the region’s history. It is wonderful to see so many people join together to fill the ice house.” She said that they expect to harvest between 7-8 tons of ice. She also credits her staff and the dozens of volunteers who make sure the event runs safely and smoothly. The Hot Soup Buffet will feature soup from area restaurants, including Alex’s Bistro, Alfresco’s Italian Bistro, Autumn Cafe, B-Side Ballroom, Blue Bee Cafe, Brook’s House of BBQ, Cafe Ommegang, the Cooperstown Diner, Cross Roads Cafe, Delhi Diner, Denny’s, Depot Restaurant & Tavern, Jackie’s Restaurant, Jay’s Place, Lucky Dog Cafe, Oneonta Bagel Company, the Otesaga, Signatures Restaurant, Simply Thai, Sloan’s NY Grill, the SUNY Delhi Hospitality Program, the Tulip and the Rose Cafe, TK’s Diner, and Undercover Eggplant. Gwen Deysenroth of Byebrook Farm in Bloomville has exhibited at the Ice Harvest Festival for years. "The Hanford Mills Ice Harvest is a rare chance to see and participate in what was a common work bee 100 plus years ago. The smiles I&apos;ve seen on the faces of people of all ages prove this is a fun event too. I highly recommend it," she says. She will be offering tastings and selling her farm’s Gouda cheese. Other local products featured at the Ice Harvest Festival are hand-knit Swedish-style mittens and hats from Catharina Kessler of Promisedland Farm in East Meredith, hand-crafted spirits from the Cooperstown Distillery, and coffee, hot chocolate and lattes from the Cabana Coffee truck. The Ice Harvest Festival is sponsored by the SUNY Delhi Hospitality Management Department, The Daily Star, and Five Star Subaru. See the website for more information, hanfordmills.org. Because GPS may take drivers on roads that are not winter-friendly, the Museum has a list of suggested routes available at http://www.hanfordmills.org/visit-a-historic-workingmill/our-location or by calling 607/278-5744. In particular, when driving from the Albany area on Interstate 88, they recommend taking exit 16 (Emmons/West Davenport) instead of exit 18 or 19. Hanford Mills Museum operates an authentic water- and steam-powered historic site, which includes a sawmill, gristmill and woodworking shop. The mission of Hanford Mills Museum is to inspire audiences of all ages to explore connections among energy, technology, natural resources and entrepreneurship in rural communities with a focus on sustainable choices. The museum, which is listed on the National and New York State Registers of Historic Places, will open for the 2018 season on May 16. Hanford Mills is located at 51 County Highway 12 in East Meredith, at the intersection of Delaware County Routes 10 & 12, just 10 miles from Oneonta, and 15 miles from Delhi. For more information, visit www.hanfordmills.org or call 607-278-5744. Take part in a traditional ice harvest, just as communities did a century ago. Festival also includes ice carving, ice fishing, horse-drawn sleigh rides, snowman village, hot soup buffet, food trucks, blacksmith demonstrations, and exhibits by local businesses and farmers. Kids 12 and under get in free; Adults and Teens, $9; Seniors, $7. Come to the Ice Harvest Festival on Saturday, February 3.